​Group lessons are a unique and fun aspect of the Suzuki Violin Method, and they are a wonderful opportunity to motivate students. No Suzuki program is complete without both individual and group lessons. All SDSSM students attend both each week. Some of the many purposes they serve are listed below. 1. Group lessons give students a peer group during their musical journey. Students feel part of a larger community of fellow string players, a team that works throughout the year to explore, improve, and perform together. 3. Parents and students attend group lessons together, which give families a chance to bond and exchange ideas with each other. ​4. Participating in group lessons is a great way for students to get experience performing in front of an audience. When students begin to play regularly at a young age in front of other people, they have less anxiety and more enjoyment when they perform in their recitals or other events in the community. 5. Motivation is one of the prime benefits of group lessons. More advanced students learn to become role models as they enhance their leadership skills, perform pieces in front of the group, and play complementary parts for the songs. 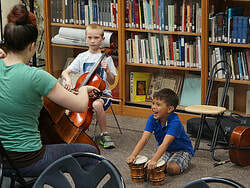 Younger or less advanced students have the benefit of playing with musicians who are more advanced, which allows them to look to those students as role models and encourages them to practice the techniques and pieces that they hear in the group lessons. 6. Groups are great preparation for ensemble work. Playing in a group involves an entirely different set of skills than playing a solo. Truly satisfying ensemble playing is a rare and exciting adventure. As the students play together, they begin to follow each other, phrase with the leader, and sound like a polished group. Ensemble skills take a great deal of time to develop, but the rewards are exciting! 7. Attending group lessons regularly has proven extremely beneficial in a child's overall musical progress, ear training, social development, and enthusiasm for their instrument.